I wore this to the second day of the Rockwell’s Bazaar. I was feeling a little lazy that day so I just threw on a pair of bright pink pants from my line, Coexist and a top from Australian online store, MILK. I wanted to wear something comfortable for the long day ahead so these loose and breezy clothes were perfect. I have been following you on facebook for a few months. I do not remember why I started. However, I am writing for the first time to say you look great in pink. Do more of it. Also, I am not saying you look bad other times. You are working some great looks. I guess that is why I keep following. Thank you Benensky! I’ll keep that in mind! Perfect! 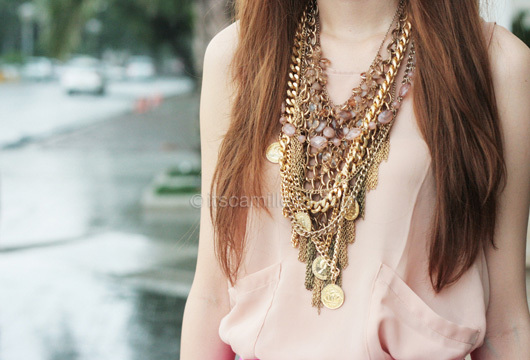 You’re probably 5lbs heavier in this look…your necklaces seem so heavy!